A Finer Remodeling company – more than 25 years experience in residential remodeling. We love what we do! MySafeHome consultations are free. 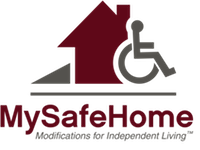 MySafeHome offers solutions today to help you overcome obstacles to your independence and improve comfort in your home. Licensed, bonded, and insured in Maryland. We specialize in ADA-compliant bathrooms and kitchens; wheelchair accessibility; and modifications for single-floor living. Learn more about us and our services.